You want a cost effective, hassle-free waste management provider to take care of all your waste needs. We compare hundreds of suppliers to find the best price in your area for general waste collection. We offer friendly, impartial advice to help arrange the right bin size for you, and collection times to suit your business. Save up to 30% on your existing service provider and get 2 weeks free servicing – only with Direct365. Our coverage is nationwide, so go ahead and give us a call or fill in our online form for your free quote. We’re compliant with The Waste (England and Wales) Regulations 2011 and Waste (Scotland) Regulations 2012, meaning you are too. We even handle all the legal paperwork, like Waste Transfer Notes & Duty of Care documentation. Ensuring that your business has the right services is our priority. Flexibility and reliability are at the heart of what we do. If you’re a growing business, no problem. As your business grows, or moves, we can adapt our services to cater your new requirements. For new businesses just setting up, and are unsure of all the various regulations that you must follow, or what bins you need, then our straight-talking experts will give you advice on any service that you need. Waste collections are available either weekly or fortnightly. We have bins available for the standard 240 litre capacity to large, 1100 litre front/rear loaders, we have bins for any business. If you produce more waste than the allocated limit, then some providers do have an upgrade available. For more information about the availability of the upgrade, give us a call or fill in a form. Whatever your size of business or amount of trade waste; we can help. 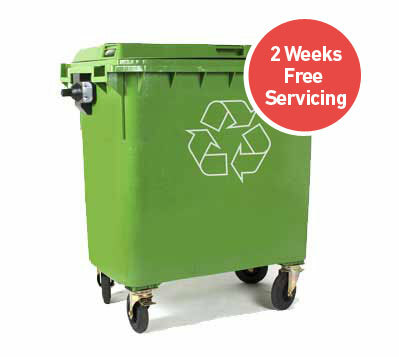 We can supply you with one small wheelie bin or up to 1100 Litre lockable bins emptied as frequently as you like. Ideal for enclosed or confined areas, our fully lockable front / rear end loaders (FEL/REL) are a popular disposal and collection service for light compactable industrial and commercial waste. Our business waste collections are thorough and professional; no waste or overspill will be left. They're discreet and won't disrupt your business providing you with excellent service. Do I need a separate Recycling Service? Yes, due to contamination and to ensure that any recycling is done properly, you will need separate bins for your general waste and recycling. Some providers will only carry out a trade waste collection with a recycling service to ensure effective recycling. We have a range of different recycling services which you can find here. Can I put food waste in my general waste bins? No, for your food waste, you will need a specific food waste recycling service. This is not exclusive to pubs, restaurants, takeaways, and hotels. It is suitable for any business. What time will you come and collect my waste? Our providers will be able to collect your bins when you need to. If you need a specific time for your waste collection, because of access to the bins for example, then we can arrange that.